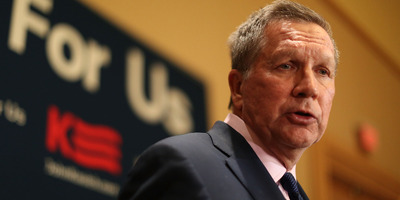 John Kasich has remained mostly quiet since dropping out of the presidential race in May. But he apparently couldn’t sit on the sidelines any longer. Donald Trump, the now-presumptive GOP nominee, has spent the last few days lambasting a federal judge for being unfair in presiding over a Trump University case because of his Mexican heritage. US District Judge Gonzalo Curiel, was born and raised in Indiana. But that has mattered little to Trump. Kasich, for his part, called on Trump to apologise. “@realDonaldTrump should apologise to Judge Curiel & try to unite this country,” he subsequently posted. Kasich joined what’s becoming a long line of Republicans who’ve condemned the Manhattan businessman for his latest inflammatory remarks. So many that the campaign for Democratic frontrunner Hillary Clinton, who’s repeatedly chastised Trump for the continued comments, cut a video of Republicans calling out Trump. “. @realDonaldTrump‘s bigoted comments about a Latino judge are so disgusting, even other Republicans are offended,” Clinton’s campaign tweeted. Mitch McConnell and Paul Ryan, the highest-ranking GOP leaders in the Senate and House, respectively, both condemned Trump’s attacks. So did former House Speaker Newt Gingrich and Tennessee Sen. Bob Corker, who have both been floated as potential Trump running mates, and Jeff Flake, an Arizona senator who, like Kasich, has yet to endorse his party’s presumptive presidential nominee. In a Sunday interview on NBC’s “Meet the Press,” McConnell said he “couldn’t disagree more” with what Trump has said. And just one day after ending his month-long endorsement standoff with Trump, Ryan distanced himself from the racially charged remarks in a Friday interview with WISN radio host Vicki McKenna. “He clearly says things I do not agree with, and I’ve had to speak up from time to time when that happens,” Ryan said, adding that he will continue to do so if necessary. Corker, who recently visited Trump at Trump Tower and has received increased attention as a potential running mate, told George Stephanopoulos on ABC’s “This Week” that he did not “condone” Trump’s attacks, but insisted on moving on to another subject. “These are things that will defeat [us],” a source within the campaign told MSNBC. Trump did manage to receive some backup from the former US attorney general under President George W. Bush, Alberto Gonzales. But it was nowhere near enough to counterbalance the roaring pushback from the GOP. The loudest roars arguably came from Gingrich and Flake. Second, to characterise, you know — if a liberal were to attack Justice Clarence Thomas on the grounds that he’s black, we would all go crazy. Every conservative would say it was wrong and it was racism. And Trump has got to, I think, move to a new level. This is no longer the primaries. He’s no longer an interesting contender. He is now the potential leader of the United States and he’s got to move his game up to the level of being a potential leader. “This judge is not Mexican,” he continued. “If this doesn’t change, we’re in for big trouble,” Flake said. “Because it’s not just ill-informed or ignorant statements, but they suggest that once he’s president after November, that he should go after that judge,” he continued. Saying Trump is “not his first choice or his 17th choice” for the presidency, he said Trump’s pitting of races, genders, and cultures against each other is everything the GOP stands against. During his interview with Tapper, Trump repeatedly denied his rationale was “racist.” But he hammered home several times the argument that Curiel’s heritage causes him to view the Trump University cases unfairly because he is planning on “building a wall” along the US-Mexico border.